Sustainable Development is an underlying theme of all the Foundation's work in the focus countries and in the UN and related organizations an conferences. PPAF was connected to events at the Rio+20 UN Conference on Sustainable Development and participated in steps leading up to the International Agreement on Climate Change adopted in Paris in December of 2015. ​The Foundation continues active involvement in these matters in project work research and presentations. On September 25th 2015, countries adopted a set of goals to end poverty, protect the planet, and ensure prosperity for all as part of a new sustainable development agenda. Each goal has specific targets to be achieved over the next 15 years. For the goals to be reached, everyone needs to do their part: governments, the private sector, civil society and individuals. Here is a list of actions that anyone can take in their everyday life to contribute to a sustainable future. The UNA-USA Southern New York State Division (UNA-SNY) and its Energy Project were co-sponsors, along with the United Nations Association of the USA, the NGO Committee on Sustainable Development and the Batey Relief Alliance. The full conference, August 27-29, drew over 3,000 participants. Moderated by D. Stillman, panelists included: (1) Tapio Kanninen, PhD, "Crisis of Global Sustainability," (2) George Garland, DBA, "Climate Policy: The U.S. and the UN," (3) Amy Parekh Mehta, Esq. "Climate Change and Energy Issues as seen in the Sustainable Development Goals," and (4) Vadim Belikov, MA, "Involving Social Entrepreneurs for Solutions in Energy and Climate Action." Posted on the website homepage is a video that summarizes the work and findings of PPAF’s consulting assignment for the Inter-American Development Bank a few months ago. 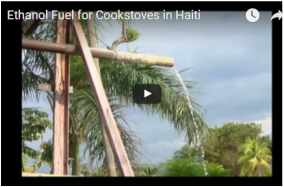 This illustrates how Haiti’s poverty, respiratory disease, and environmental problems relate to burning wood and charcoal for family cooking and small businesses, and the possibilities for fuel ethanol from Haitian sugarcane. PPAF and associated organizations are currently developing further action steps to address these issues. ​With its focus on the impoverished Haitian and Dominican inhabitants of what began as migrant labor camps for sugarcane workers (i.e., bateyes) in the Dominican Republic, the Batey Relief Alliance (BRA) and PPAF have a natural affinity, drawn by humanitarian concerns and a desire to promote agribusiness, health and better living conditions at the community level. During June-August 2014 cooperation included these: (1) PPAF arranged for the host of Global Connections TV, Bill Miller, to interview BRA’s CEO Ulrich Gaillard at the UN. (2) PPAF interns and volunteers prepared English and French translations for a BRA video that was originally recorded in the D.R. in Spanish. (3) PPAF provided an intern to work for two months in a BRA animal husbandry program focused mainly on raising and selling pigs in batey communities. (4) PPAF co-sponsored and moderated a BRA seminar at the UN Department of Public Information / NGOs conference on August 27 at UN Headquarters. This featured the video on BRA’s work. David Stillman gave a keynote address on sustainable development at the General Assembly of the World Association of Former UN Internes and Fellows (WAFUNIF). The event was held on November 14, 2011 in the offices of the UN. The event was livestreamed to WAFUNIF members worldwide. ​To view the video, click here. A panel on goldmining served as a side event to the UN Commission on Sustainable Development, held at the United Nations. The Pueblo Viejo Dominicana mine in the Dominican Republic was a special focus. PPAF invited Jean-Marie Wolff, president of SImACT Mining Holding Inc., who joined David Stillman and George Garland at this event. SImACT controls a property in Haiti with both gold and copper potential. Click here for more information under the section News and Events. The Humpty Dumpty Institute engaged David Stillman as keynote speaker at “Sustainability Dialogue Day” at Maricopa Community College System in Phoenix, Arizona. The ten colleges of the System have an enrollment of over 260,000 students. David Stillman was a panelist on sustainable development at the annual conference hosted by the Committee for Teaching About the UN (CTAUN). About 500 participants attended. PPAF partnered with the Haitian-American investment group SImACT to hold the Workshop "Reconstruction and Business Opportunities in Southern Haiti" at the Cap Lamandou Hotel in historic, damaged Jacmel Haiti, on June 12-13, 2010. ﻿Seventy representatives from the UN, the private sector and civil society met on July 16 for deliberations on “Partners against Poverty – Awareness, Agreements and Actions”. This second annual meeting touched on a range of topics, including: agribusiness; tourism and the environment; women, entrepreneurship, and microfinance; health; and renewable energy. The national conference "Todos Bajo un Mismo Techo - Por un Turismo Dominicano más Competitivo y Sostenible" [Everyone under one roof - for a more competitive and sustainable Dominican Tourism] took place April 18-20, 2008 in Santiago, D.R. Conveners were the Ministry of Tourism, the National Council for Competitiveness and the US Agency for International Development through the Dominican Sustainable Tourism Alliance (DSTA). PPAF was one of 140 organizations there. PPAF board members participated in June 2008 at the Roundtable of Partners to the Madagascar Action Plan, which had jointly been prepared by the Government, the World Bank, UNDP and other major donors. PPAF met with senior government and business representatives. Prior to formal establishment of PPAF, team members worked with Madagascar officials in policy development for public-private partnerships. Meetings were held with the President, Prime Minister and other Cabinet Ministers. A first success in matchmaking was stimulation of a request by the President of Madagascar for Land o' Lakes, Inc. to work with the Ministry of Agriculture, Livestock and Fisheries, to prepare a master plan for rural development that would be market-driven and business-based. The text of the plan was completed in 2004. Its implementation was linked to and enhanced other elements of the policy framework for the country. In the photo: 2nd from right, Minister of Agriculture with 2 of his staff; from the left: D. Stillman, Amb. Andrianarivelo; Kristen Penn (Land O Lakes). A working group "Alliance Madagascar" was established, including high-level representation from the Ministry of Agriculture, Livestock and Fisheries, the Association of Small Business Owners, the Association of Microcredit Institutions, the Prime Minister's Office & Madagascar's Ambassador to the UN.